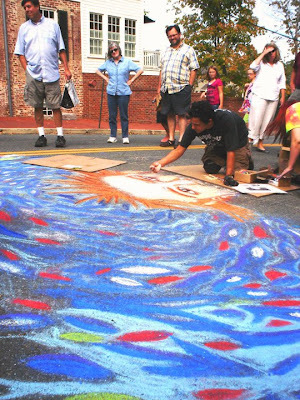 September 25-26, 2010: The first annual Via Colori Fredericksburg event hit the downtown last weekend. There were dozens of artists that used the pavement as their canvas for this two-day celebration. Although Sunday morning's rain set us back a little, we managed to pull off a 100 square foot mural by Sunday afternoon. Below is a sequence of the painting. I'll be posting more photos of the other artists' pieces soon - so stay tuned. In order to recreate the "Neptune's Daughter" image, I chalked up a 10'x10' grid to enlarge the graphic. By lunchtime on Saturday, we had mapped out most of the line work. The family stopped by for a quick critique and some ice cream. Following the rain, we were able to resume by 1:30 Sunday. Diego pitched in too. This was my first time using chalk pastels on such a rugged surface. I really enjoyed the last day, since we were able to experiment with colors and gradients. On Sunday, some of the PONSHOP fans stepped up to help finish. Thanks to fans and family for their help (left to right): Jeff, Jessica, Big D and Kevin. Congratulations to all the participating artists. Thanks to the Via Colori event organizers and all volunteers. The weekend proved to be one of the most exciting and memorable events for our city and the Fredericksburg art community. To view more pictures, visit Via Colori Fredericksburg on Facebook. Click Here to view the feature article on Via Colori in the Freelance Star.